This complete conversion kit converts a T8/T12 8-foot fixture from two (2) 8-foot fluorescent tubes to four (4) 4-foot toggled LED tubes. This kit includes: (1) 8-foot to 4-foot conversion kit (converts (2) 8-foot tubes) and (4) 4-foot D-series 5000K (dimmable) toggled LED tubes. 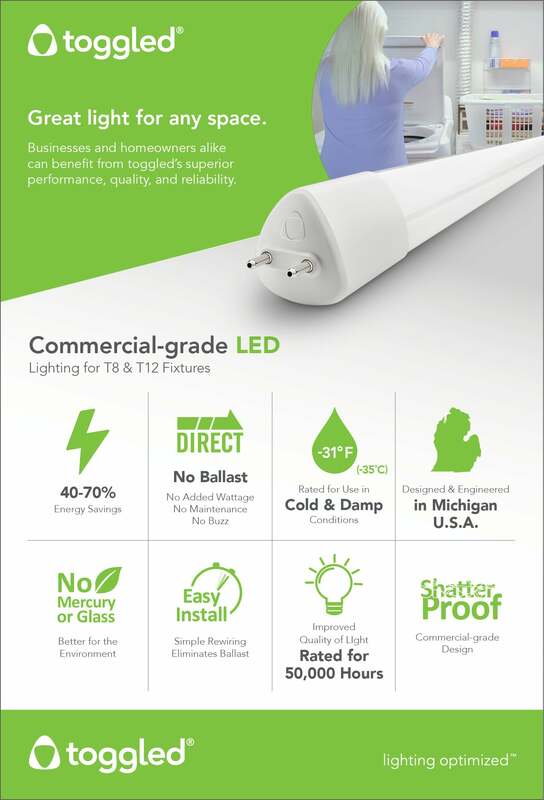 Enjoy energy savings of up to 70% and improved quality of light by converting existing 8-foot fluorescent fixtures - bypassing the ballast - to work with toggled 4-foot LED products. Typical installation time is within 15 minutes to begin enjoying all the benefits of toggled LED direct-wire lighting.